Are you ready to get Deco Glam?? 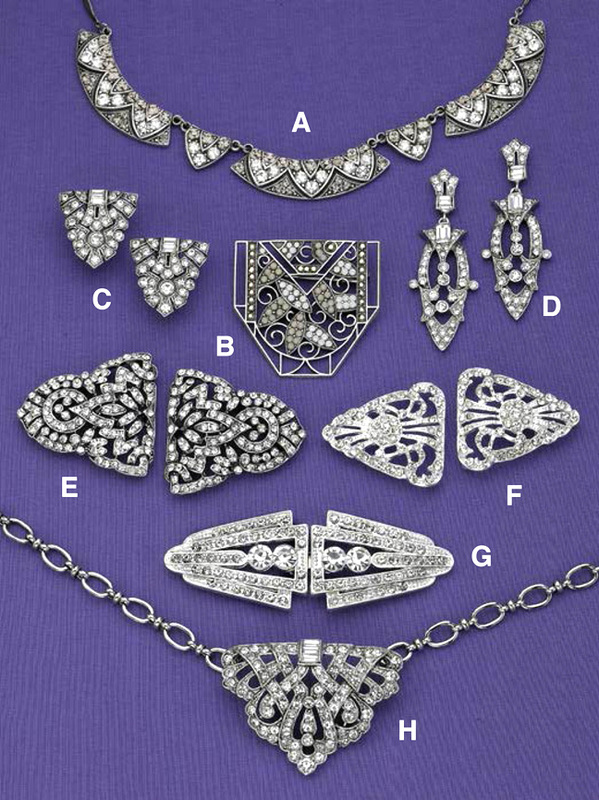 We’re ready for you with this wonderful collection of sparkly Deco necklaces, pins and earrings. We wish they were diamonds and platinum, but these fantastic re-creations are more affordable. At the top of the photo, this beautiful necklace (A) is made up of Swarovski crystal segments connected by chain. The length adjusts from 16”- 18” so it will comfortably fit most necks Immediately below in the center, is a shield shaped pin(B) (nearly 2” wide) with intricate Deco metalwork and decorated with two shades of opal crystals. Metal on both is silver plate over bronze with a softer antiqued finish. Two pair of earrings flank that brooch. The smaller triangular shield design (C) is 1” high, while the bigger one, a dangling arrow (D) hangs down 2-1/2” long. They have hypoallergenic posts and are made with exquisite European crystals and rhodium plated metal, giving them both a very rich look. Using the same materials, the large crystal buckle necklace at the bottom (H) is a bit over 18,” reaching the hollow of your neck. The beautiful alternating link chain attaches on both sides of the central 2” wide highly jeweled piece.